One day in Rishikesh, Baba was giving Chanji instructions at the mandali’s quarters when a sanyasi came to the gate desiring darshan. 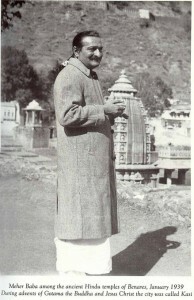 Chanji went to him and told him that Meher Baba, being in seclusion, was not seeing anyone until his tours in the Himalayas were finished. Where doest thou seek me, O dear devotee! I am always near and with thee! Repeating these lines louder and louder, he raised his arms dramatically and walked off, looking toward the heavens, as if pleading with God to grant a little sense to poor Chanji to be able to recognize someone as sincere as himself. But the ironic part of the whole affair was that, had the man not been so absorbed in his own performance, looking toward the sky, he would have seen Baba, who was off to one side, watching all the time! Twice, he passed Baba without recognizing him. “His time has not yet come. People like him wander from place to place, haphazardly, in search of God, muttering verses and chapters from the shastras and chanting couplets from the poets, but all superficially with the tongue, and not from the heart. They gain very little — practically nothing, spiritually.